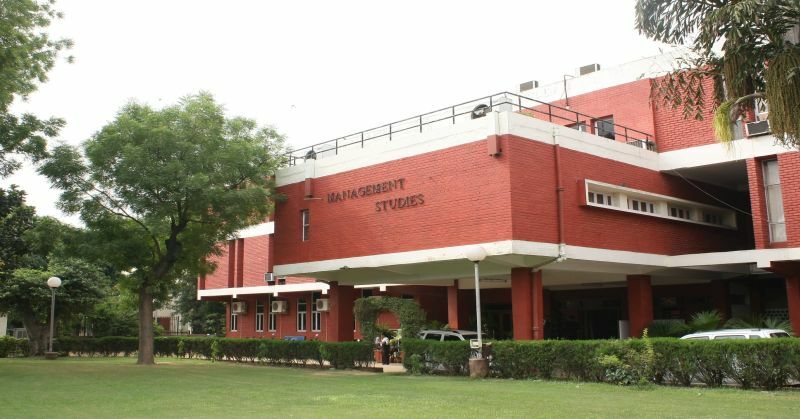 FMS, Delhi is the only top B-school in India that is in Delhi. Most companies have their offices in Delhi, Gurgaon and Noida and this makes FMS the closest top B-school in India with regards to industry. Located right in the heart of North Campus, University of Delhi, FMS is just a stone’s throw from Kamla Nagar market. You can have the tastiest of foods whenever you want. Not many B-schools would be able to boast of this. Most campuses are located so far away from the rest of the civilization that by the end of two years, many start liking their mess food. Most B-schools take pride in having sprawling campuses, FMS probably has one of the smallest campuses in North Campus, but one wouldn’t find better utilization of land and resources anywhere else in the country. One won’t find crores of rupees being spent on eye candy installations. The money here is spent on things that would actually benefit the students, such as a Bloomberg Terminal in the Finance lab. The campus is soft on animals. It is a paradise for animal lovers like me. The guards aren’t harsh on cats and dogs who mean no harm to anyone. A tiring day is made better with these animals around in the field outside. I always carry a packet of biscuits with me to feed them. I don’t think that I would have had this opportunity anywhere else. Due to the small size of the campus, it is always easy to find the person that you are looking for. Due to being part of the University of Delhi, we at FMS have the access to the DU Sports Complex. No other B-school in the country would be having these many gym and sporting facilities. In the short time that I have spent at FMS, one incident stands out from the rest. During my first business communication class, the professor was teaching us about the 7 C’s of communication. I was awake the whole night before that for I was working on an assignment that had to be submitted that day. As a result, I was droopy the entire time. Midway through the lecture, I fell asleep for a few moments and at that exact same time, the professor asked me a question. I woke up on hearing my name (I think the professor remembered my name probably because there are two Eshaans in the class). I had not heard what the question was, but as a reflex, I spurted out “Yes, ma’am”, as if it was a roll call. I later learnt from others that she had asked me if I was sleeping. It was a pretty embarrassing moment and I was asked to go out and wash my face. Dhruv Gupta: This unamused chap does not get stressed easily. Skilled at playing the guitar, ukulele and mouth organ, he will blast music from his amplifier every night before an important submission to calm his nerves. You will often find him in his natural state – talking to himself aloud. It is sometimes a scary experience and makes you wonder if he is possessed or something. Lakshay Nagpal: He is an experienced trekker, having done over 10 treks in less than four years, and wanted to join a professional mountaineering institute and scale Mt. Everest. Money and career path stopped him from joining it. He was completing the Dhauladhar trek two years ago when he got lost for 5-6 hours. During this time he was also chased by a bear. He’s lucky and happy to be here with me at FMS. Aditya Bhale: He is an engineer. But that is the most boring part about him. He has a master’s degree in Tabla. He has football academy in his native place – Khairagarh, Chhattisgarh – where students are taught for free. His voice is arguably the best on campus. He is also trained in classical vocal experience. Megha Gupta: She is one of the most diverse people on campus. She learnt salsa for almost a year, once coloured her hair grey. She likes to play football (one of the very few girls that I know who like to play football). She knows how to ride horses and once placed money on a horse in a derby. While at BCG, I was a part of the Industrial Goods (IG) team. The IG team works on cases related to the sectors such as textiles, metals & mining, agribusiness, cement, pulp & paper, automotive, aerospace & defense, real estate, shipping, construction & infrastructure, and chemicals. I believe I would be a good fit at Hindalco Industries Limited as it is involved in metals & mining, chemicals, and agribusiness – sectors I have some knowledge about. That being said, I believe I can explore more industries as well. Just because I have not worked on certain industries should not mean that I summarily discard them. As someone who likes to learn new things, I would also be comfortable with sectors that I currently don’t have much knowledge about.